Bats might have invaded the Austin Road Elementary School in western Mahopac but students, faculty and staff are not the least bit concerned. As a matter of fact, the school family is thrilled that teacher Mary Jean Cerbini and her fifth graders have placed artist’s renderings of bats on walls throughout the school building in conjunction with the “Habitats for Bats” curriculum project being held in conjunction with the New York State Department of Environmental Conservation. 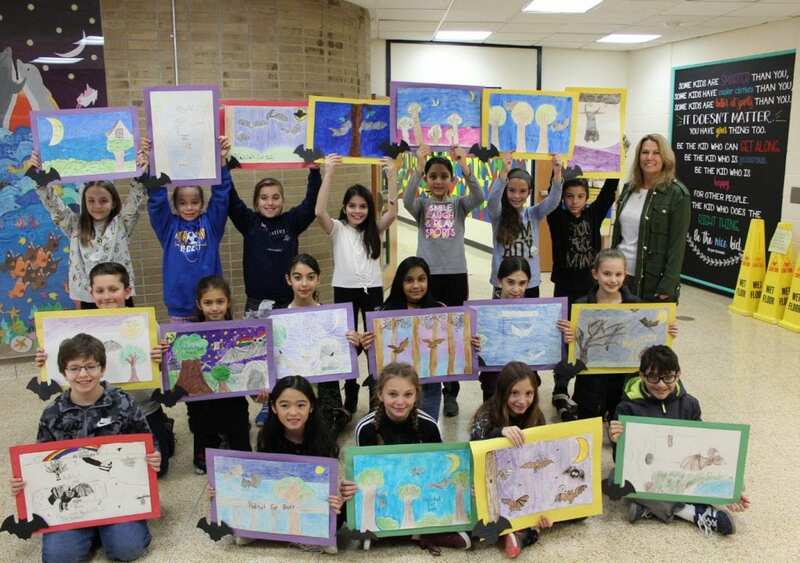 As part of the project, Austin Road students were encouraged to create and submit posters depicting the knowledge they learned regarding bats such as habitation, hibernation and roosting. Last week, Cerbini selected three entries submitted to the state for judging. The finalists included: Lena Ademi, Sophia Camastro and Emma Westcott. Regional judging will take place in upstate Cortland with nine regional champions vying for the New York State title in 2019. This school and the students are incredible! While most of the human population would have lost there heads, these students have shown both curiosity and respect for these tiny mammals we depend on for food and insect control. Bat lives matter to sustaining agriculture and are threatened by White-Nose Syndrome. It’s is very important not to disturb hibernating bats. Thank you for respecting them and using this unusual event as a teaching and learning experience.